At our last contest in Barnesville, we tried a new pork dry rub. You should never make changes at a contest, but sometimes I don't even listen to myself. Like my Dad told me when I was a child, "Do as I say, don't do as I do". This time I got lucky and the change worked well enough to get a 2nd place in pork. We also used our rib sauce (listed in our book, "Competition BBQ Secrets" www.bbq-book.com) to baste the chunks of pork very lightly before placing in the turn in box. This rub is very spicy and I wouldn't recommend using it on ribs or chicken unless you really like the heat. When cooking pork for 8 to 10+ hours, the spicy heat is reduced and just more of the flavors of the pepper remain. I haven't tried this rub on brisket, but I think it might work also. Something else I have to cook now! Note: these may be the "Cowboy" brand now. 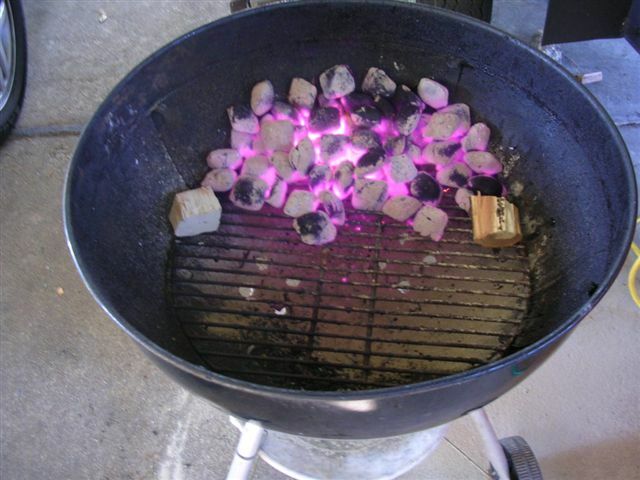 We have been using Kingsford Charcoal briquets for more than a year in competitions. We like the consistent heat charcoal supplies and there is much less tending to the fire compared to burning all wood. 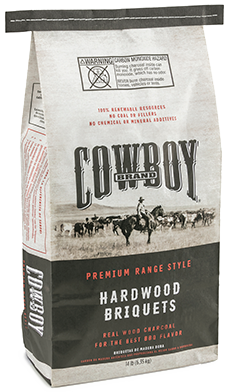 But recently we were able to purchase some Duraflame Hardwood Charcoal Briquets and try them in our Lang Model 60 smoker. First thing, I noticed on the bags label that the briquet consisted only of 95% hardwood and a vegetable starch binder. The Duraflame charcoal contains no chemical additives, mineral fillers, coal or petroleum by-products, something that had always worried us about Kingsford. It appears that the Duraflame is a very natural product. I start all charcoal in a charcoal chimney without using lighter fluids that may taint the smoked meats. If you've never used a charcoal chimney, I'm guessing that you pile your charcoal and douse with lighter fluid before lighting the fire. There's nothing wrong with using a chemical starter, but I bet everyone has at some time eaten food that had that "chemical" aftertaste. This is caused by cooking on the coals before all the lighter fluids have burned off. It always seemed to me that it took longer to burn the charcoal down to white-hot coals, than it did to actually cook the meat on the grill. 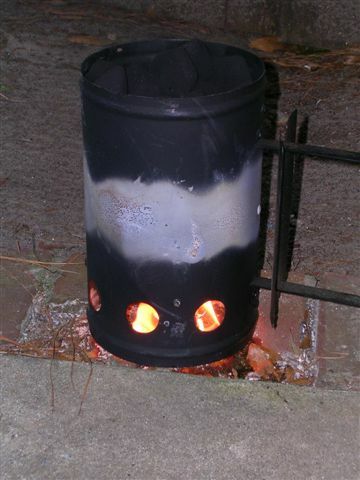 Here's a picture of my charcoal chimney hard at work making coals from the Duraflame charcoal. Compared to the Kingsford charcoal, the Duraflame seemed to make much less smoke when igniting in the chimney. The smoke also appeared "cleaner" than Kingsford charcoal which gives of a thick white, sometimes yellowish smoke when starting in the chimney. Also the odor of the Duraflame was much more pleasant than Kingsford when starting. After putting the hot coals into a Weber kettle grill, I noticed the temperature was really high, much higher than when using Kingsford (Duraflame claims the higher temperature is because they use so much hardwood in the briquets). I closed the bottom air vents down and lowered the temperature of the fire. I cooked a pork tenderloin and four chicken thighs to test how the Duraflame affected taste. I couldn't detect any "off" flavors in the meat from the Duraflame. Everything tasted fine! As I write this letter, I'm cooking a slab of baby-back ribs and two butts on Duraflame charcoal. The grilling test was so successful that I know bbq cooked low and slow with Durflame will taste great. Our contest schedule for June has us cooking 3 contests and possibly another local one on the 4th of July. So we will have a chance to try Duraflame in a competition and I'll post the results in a future newsletter. Overall I would have to highly recommend Duraflame Hardwood Charcoal Briquets. Be careful and choose the right Duraflame product. They also have a lump charcoal and a charcoal briquet (no Hardwood on the label). June is going to be busy for us. We are cooking at our third Florida BBQ Association contest for this year. It will be June 2nd and 3rd in St. Marys, GA. This is a Jack Daniels Qualifier Event and we are real excited to cook in a contest so close to home. Two weeks later on the 16th and 17th, we are cooking in another Florida BBQ Association contest in Callahan, FL, just outside of Jacksonville. And the following weekend, June 23rd and 24th we will be at Boone Hall Plantation, Mt. Pleasant, SC for a Kansas City BBQ Society (KCBS) contest. We cooked at Boone Hall last year and finished 4th in chicken, 3rd in ribs, and 4th in brisket. Our pork was a disaster and it literally cost us the Reserve Grand Champion spot and $1,000 more prize money! I'm hoping our new pork rub can help us avoid another letdown. And two weeks after Boone Hall, we will be cooking in a small non-sanctioned contest at Port Royal, SC for the 4th of July Flying Pig Festival. If you happen to be at any of these contests, please feel free to come by and speak with us. We'll be glad to answer any of your questions. Don't apply dry rub on ribs overnight if salt is listed first or near the top of the ingredient list on the rub. Salt on ribs for too long will cause the meat to be dry and taste "hammy". Safe bet is to put rub on while ribs are warming up to be placed on smoker. Don't leave charcoal in open bags because it can absorb moisture and the next time you cook, the charcoal will be hard to light and may smoke too much. Best to place contents of open charcoal bag into a plastic container that can be sealed. Everybody wants baby back ribs (loin back ribs) because that's what the restaurants all advertise! But baby back ribs can be tricky to cook. They have a narrow window of doneness. A better choice is Spareribs cut St. Louis style. This cut makes the spareribs look like a loin back rib, but they cost much less. Spareribs also have more fat marbling that makes them more forgiving if they are overcooked. It's easy to get the sides of the tray dirty with sauce or meat juices when placing the meat in the turn in box at a contest. Some boxes won't get stained by sauce, but some might. Don't risk it. Cut strips of wax paper to lay on the sides of the box before you start placing meat in it. After you're satisfied with the meat placement, gently remove the wax paper strips. Tools for turn in box prepping. Q-tips for spot cleaning the box. Toothpicks for picking up meat. Small scissors for trimming any "loose ends" on meats. Small basting brush for touching up sauce on meats. Camera for taking pictures of each turn in. Most contests require 6 or 8 discernable pieces in the turn in box. Two reasons to put more. First a box that is full of meat looks much better than a box with just enough meat to be legal. Secondly, most contests set up tables for the volunteers to sample any judging leftovers. Without these volunteers we wouldn't have the many wonderful contests to cook at. This is the real reason we always try to put in more than is required.